A drawing in ink of Nottington well near Weymouth in Dorset. This springwater well was one of a number off the road known as Broadway. At the time Grimm made this picture, it was commonly used by farmers as a 'cure' for sick cattle and dogs. 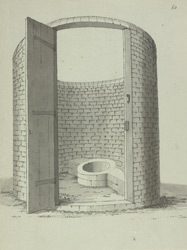 By the 1820s, however, Nottington gained a reputation as a spa and wells like this were visited by upper-middle-class townsfolk who used the waters as a restorative.